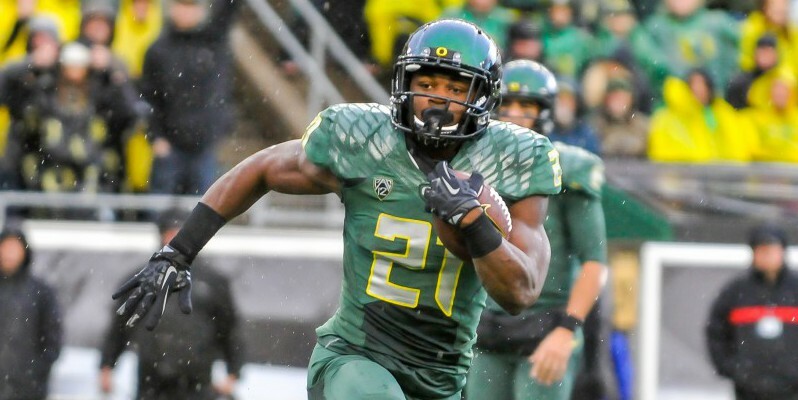 ESPN Poll: Royce Freeman the Next Pac-12 Player of the Year? Duck fans can expect a lot of changes next season. While questions surround the Oregon football program in the post-Mariota era, it’s the return of running back Royce Freeman that gives the Ducks a legitimate shot at another post-season run in 2015. In a recent ESPN poll, Freeman is among four Pac-12 candidates projected to be Pac-12 player of the year. The Ducks’ All-American running back and Pac-12 freshman offensive player of the year astonished fans in his collegiate debut season, bulldozing for 1,365 rushing yards and 19 all purpose touchdowns in 2014. Many in Eugene and around the country believe that Freeman is primed for an even bigger season as Oregon’s projected starting running back in 2015. From 2007 to 2013, Oregon’s rushing offense has ranked in the Top 10 nationally thanks to long time running backs coach Gary Campbell. His reputation for developing raw talent into intelligent and powerful backs has provided Oregon a lethal running game for years. However, last season the Ducks saw a slight drop in their rushing output. There was a good reason for that. The Oregon offense centered around Heisman Trophy winning quarterback Marcus Mariota. With Mariota off to the NFL, Oregon may turn to its strong reserve of backs for consistent offensive production. Next season, Freeman is joined by the return of Thomas Tyner, and newcomers Taj Griffin, Tony James and Kani Benoit. Regardless of who Oregon’s next quarterback might be, look for Freeman & Co. to help fill Mariota’s void.